It is a new toy that should be on its way to me soon. It's made by Craig and the other fine folks at A&A. It measures about 2 feet in overall length, give or take. I assume that you would not use an ice pick grip with a rondel of this length. Is this a safe assumption? 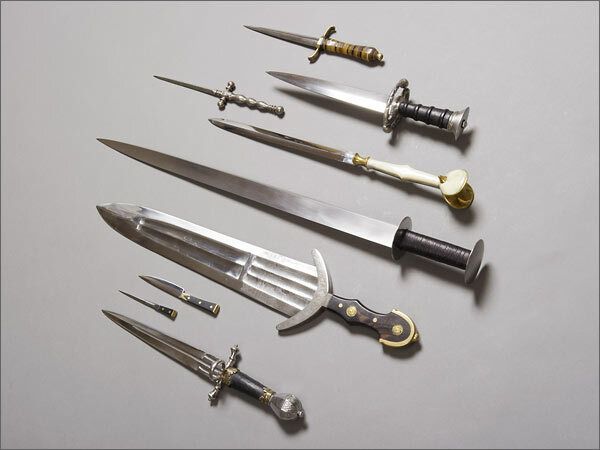 Were daggers of this length simply a matter of a well-to-do gentleman saying "mine's longer than yours" or were they designed for a specific style of fighting? I wouldn't assume that one wouldn't use the ice pick grip even with this long a blade because such a long blade is very difficult to block using most blocking techniques since even a successful blocking of the forearm holding the dagger will not keep the point of the dagger from reaching you: My dagger and wrestling instructor mentioned this aspect about very long daggers when I took a course last Summer. Oh, and very nice dagger Chad. Thanks, everyone! I'm looking forward to receiving this one. It should be in-hand late this coming week. I'm not sure if any of the martial treatises discuss the use of daggers of this length. I'll leave that to the more well-versed to answer. I'll try to post more pics of it when I get it. I know I'll do a group shot to update the Daggers in your collection thread. It should be interesting to see this new monster next to all the rest of the daggers. My dirk, which is not tiny at 20 1/4 inches long, will not look so huge next to the newcomer. And I'm sure the new rondel will look like it could eat (or did eat) something as small as my Arma Bohemia ballock dagger, which is very slight. Checking out the period art posted earlier in the thread shows long daggers held both point-up and point-down. I would guess (which is all it is) that some of the techniques normally associated with a sword could be used with something of this length. I'd also think some dagger-specific moves could be as well. But I'm not sure. 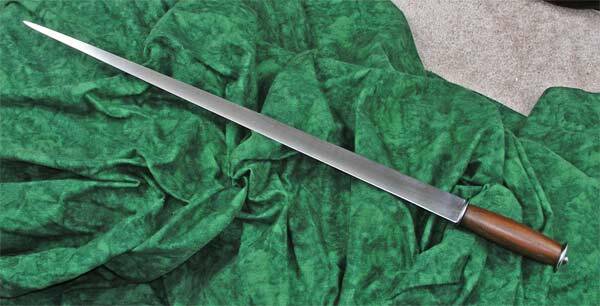 My Eric McHugh Rondel Dagger is 25.5" long with a 21.5" long blade. It's really almost like a sword. Very nice and what a coincidence I just received my scian from A&A, almost exact dimensions also. There's an interesting long dirk in Cannan's "Scottish Arms and Armour" (pg 96). The blade is cut down from a sword. How long, I don't know. 16" blade? 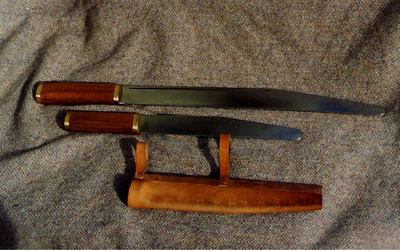 Noting the style of fuller, one could do a home-made version of this by starting from a "ninja" sword blade with fuller. This looks nice enough and interesting enough to possibly tempt me away from using such a blade for a seax. I haven't seen very many dirks with fullers like this, outside the many Vince Evans dirks with fullers like this posted here by many. Long dirk, from pg 96, F. Cannan, Scottish Arms and Armour, Shire (2009). Photo credit: West Street Antiques, Dorking. Vadi recommends a dagger whose blade "reaches to the elbow" (is as long as the forearm?) and whose handle is a length Porzio and Mele couldn't translate, which sounds like 40 cm or so overall length. But some of the illustrations show an even longer weapon around 60 cm long (then again, his illustrator wasn't the best at technical detail). I agree that you could use it like a short sword (60 cm is definitely sword sized) or a long dagger in normal or icepick grip. deutsch, 1.Hälfte 15.Jhdt. Lange, beidseitig gegratete Klinge mit gebogener Parierstange und facettiertem Kugelknauf. Mit Wachs konservierter Bodenfund mit guter Substanz. Seltener Dolchtyp. Länge 60 cm. German, 1st half 15th century. Long, curved blade with both sides gegratete guard and faceted pommel ball. With growth of conserved land fund with good substance. Rare type of dagger. Length 60 cm. Long, double-edged blade with ridges on both sides and stamped decoration on the ridges. Slightly curved quillons with marks stamped on the rectangular tapered tang. Round iron pommel, in cross section a pointed oval. The entire length is unusually well preserved for an underwater discovery, the point is slightly corroded and it has a black patina. Length 59 cm. Cf. Müller/Kölling, Europäische Hieb- und Stichwaffen, p. 177, No. 59.
discovered in Castillon-la-Bataille. Slender thrusting blade of diamond section. Tapered quillons slightly curved toward the blade. Narrow tang, the slightly oval disk pommel tapering towards the top. Length 59.5 cm. Provenance: Dordogne or Lidoire in the vicinity of Castillon-la-Bataille. So far only three daggers are known from this discovery site, along with a total of about 80 medieval swords discovered there. Cf. E. Oakeshot in "The Tenth Parklane Arms Fair". p. 9.
these id imagine would be perfect for the press of a shieldwall. Combat seax with 21 inch blade and 6mm spine. Elm timber grip with brass end caps. With elm grip and brass end caps. Little thread necromancy here. Can anyone help me identify the painting, context and date of the close up image below? I've had it for a while, and I believe I found it in relation to myArmoury, but I haven't been able to find it again on the web since I first found it. Can anyone help me identify the painting, context and date of the close up image below? I don't recognize it specifically... I'd guess by the style that it is German or maybe Dutch, second half of the 15th century. 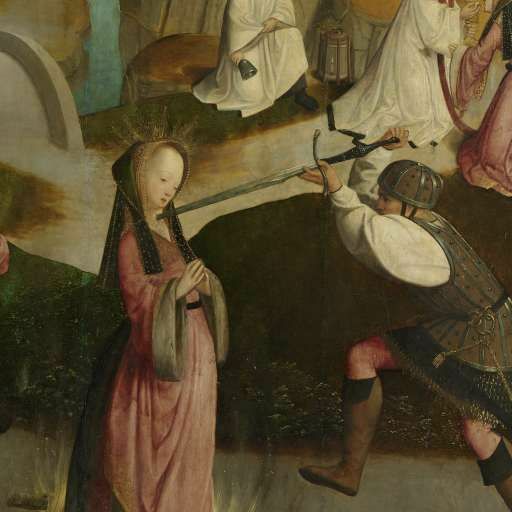 It appears to be a martyrdom scene... St. Catherine is the female saint most commonly depicted with a sword, but I think this is St. Lucy instead. 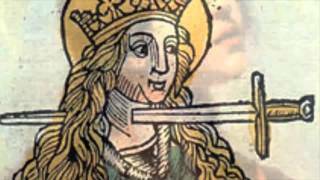 The sword/knife blow to the neck seems to be common iconography for Lucy and not for Catherine, who is usually holding the sword, or shown about to be beheaded. Hope this can help someone track down this painting! Found it! 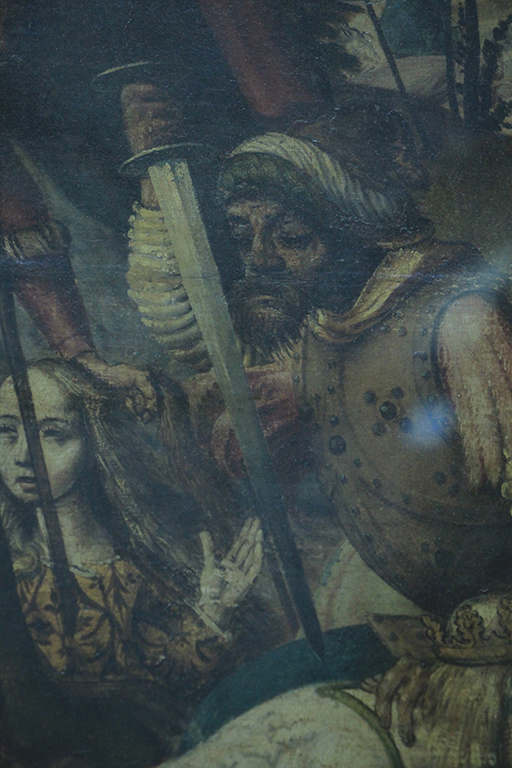 It's from a Martyrdom of St. Ursula in the V&A Museum. Wow, nice detective work! Thanks very much for posting a reply to this; it's very helpful.